The Developer Spotlight is an interview session with many of the top designers and developers of interactive media from around the world. This edition will be an interview with Adnaan Wasey from POV/American Documentary, winners of the Best of Category Award for Best Documentary project, “POV Interactive Digital Shorts,” in the 2014 Horizon Interactive Awards Competition. HIA: Adnaan, thank you for taking the time to talk with us. I am hoping that by sharing stories and interviews of developers all over the world, we may begin to be a source where business owners, designers and developers can go to share ideas and learn from one another. Most importantly, we are keeping with our mission to highlight great talent from across the globe. We would like to congratulate you on your win in this year’s competition. Thank you, we are all honored and elated here to have been recognized for this work. HIA: So, tell us a little about the project. We’d like to know how it came to be. Adnaan - POV/American Documentary: We've been playing with ideas in "interactivity" online since 1994 - it's part of the DNA of POV, which has been creating "two-way television" since 1988. 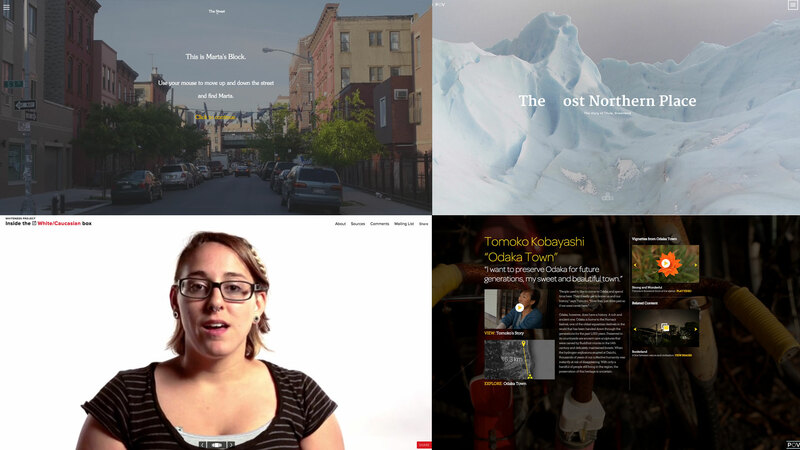 We created PBS's first interactive storytelling project, "POV Borders," which won us our first Webby Award in 2004, and a few years after that, we started POV Hackathon, a lab for accelerating how filmmakers who traditionally would have worked in the nonfiction film or TV format incorporate new technology -- often web technology, because the browser has not yet been fully explored as an interactive medium, both for art and entertainment. It's this mindset that connected us with the six projects that encompass the POV Interactive Documentaries series, and allowed us to share how we can push the web browser to its limit in a flashy way, but also how we can share artful experiences where the technological innovation was mostly hidden. Adnaan - POV/American Documentary: POV aired its first broadcast on PBS in 1988, and 28 years later we are television's longest-running showcase for nonfiction films. In 1988, there was no high-profile home for documentaries, and the World Wide Web certainly hadn't been invented yet - no social media, no DVDs, not even CD-ROMS! But the idea then, as it is now, was to have a dialogue with television. But of course, times have changed. We're seeing more media creators who might have made a traditional 90-minute documentary for the movie theater or television now realizing that the web and new devices can serve the same goals for interactivity and engagement. HIA: What is on the “Horizon” for the POV project/site? Adnaan - POV/American Documentary: We're continuing to create bigger, longer and more elaborate "interactive films," and at the same time we are continuing our lab (POV Hackathon) around the United States, in New York City, Los Angeles and Chicago. It's a joy to work with forward-thinking media creators and developers, and we are proud that more than half of the projects that come through the lab have been realized. HIA: Where do you see the future of web video going? Adnaan - POV/American Documentary: Of course it's impossible to say, but it's possible to do so much on the web that isn't possible in traditional television or film. Every screen is a television, bandwidths are increasing, and the grammar of interactive storytelling is still being defined. We could keep doing things as they've been done, but we're more excited to continue exploring what's possible. HIA: Talk about what the Horizon Interactive Award means in terms of the project and overall goals/team. Adnaan - POV/American Documentary: It means so much. This is a first award for many of these creators, who took a leap of faith to embrace interactivity and who only sought to create exceptional stories. These were projects created from passion, and no one could have predicted any honors to come. To have this recognition come from peers means even that much more. Adnaan - POV/American Documentary: We hope that anyone interested in interactive storytelling will stay connected with us @povdocs and at pbs.org/pov and that you consider applying to POV Hackathon with your bold visions for the future of film at pbs.org/pov/hackathon. Thank you for taking the time to talk with us. You should be proud of the excellent work that took home the top honors in the Documentary category in this year’s competition. We look forward to having you back again next year.